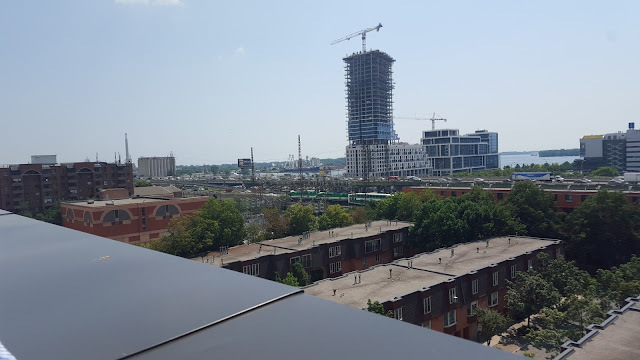 View from rooftop of Woodsworth Housing Co-op, overlooking the co-op's 40 year old housing stock below, the eastern Gardiner Expressway, waterfront condo developments, and other derelict industrial lands that will be sold to Alphabet/Google. Trudeau made the international headlines again at the end of October, not only because of his grief over the passing of Gord Downie of the Tragically Hip whose Secret Path is hopefully not only an operatic requiem to his own life but to colonial power in Canada as well (one be hopeful), but also because Toronto will be home to Alphabet's new smart city and Trudeau was there ready to lend a face to the project. Given recent policy initiatives back home on this side of the pond -- the 3rd industrial revolution, wooing Google, and ogling at asteroid necklaces -- I can't help but wonder if Luxembourgish leaders are either getting jealous or starting to salivate at the possibilities. "is a joint effort by Waterfront Toronto and Alphabet’s Sidewalk Labs to create a new kind of mixed-use, complete community on Toronto’s Eastern Waterfront, beginning with the creation of Quayside. Sidewalk Toronto will combine forward-thinking urban design and new digital technology to create people-centred neighbourhoods that achieve precedent-setting levels of sustainability, affordability, mobility, and economic opportunity," (Sidewalk Toronto). Needless to say, the project has larger implications for urban development in general, as it is targeted for an area that is currently undergoing massive transformation as a result of certain policy frameworks that enable various kinds of interrelated turbo investments. In fact, as information about Sidewalk Toronto hit the newspapers, I was already preparing a blog post on this topic, because I took two tours of the area this summer (more on this in a follow-up post). But this project has received widespread attention in the news in recent weeks -- most of it rather skeptical, asking some rather hard questions.